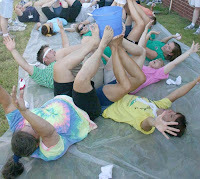 Choose two teams of four, Have the team lie on their backs in a circle with their feet raised to meet in the middle, balancing a bucket of water on their feet. Each team member must remove his/her shoes without spilling the water. This can be a class competition.